Eastern junior Jess Parker drives past a BHS defender during a TVC Hocking girls basketball game on Dec. 16, 2017, in Belpre, Ohio. South Gallia senior Erin Evans (11) launches a two-pointer during the Lady Rebels’ win over Ohio Valley Christian on Dec. 29, 2017, in Mercerville, Ohio. 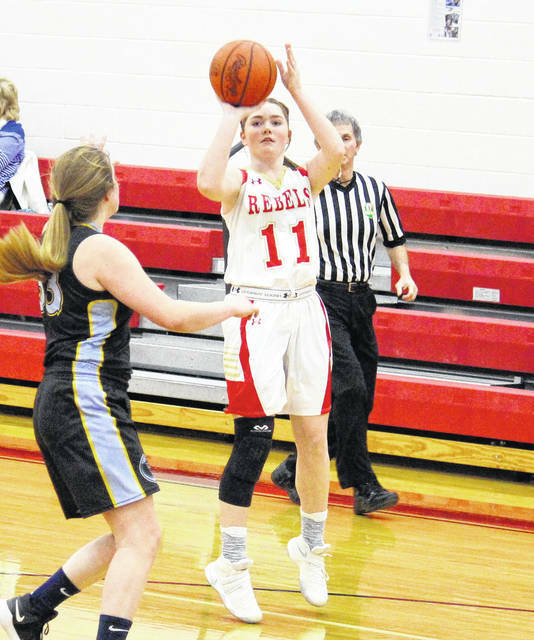 A total of eight local girls basketball players — divided evenly between Gallia and Meigs Counties — were selected to the Ohio High School Basketball Coaches Association District 13 teams. Locally, Eastern garnered the most spots with three players listed in Division IV. Lady Eagle seniors Elizabeth Collins and Madison Williams, as well as junior Jess Parker were all on the second team. Collins was also on second team last season, while landing on special mention as a sophomore. Parker was a special mention last season, while Williams was a first teamer in her freshman campaign. Also in Division IV, South Gallia’s lone selection was senior Erin Evans, who was named special mention for the second straight season. In Division I-II, Gallia Academy landed two players on the list, while River Valley had one. GAHS sophomore Alex Barnes — who was a special mention last season — was named to the second team this year. Blue Angels freshman Ryelee Sipple was named special mention. RVHS junior Kelsey Brown was also chosen as a special mention for a first time. In Division III, Meigs’ lone representative was junior Kassidy Betzing, who was named to the second team. Betzing was a first team selection last year and a second teamer as a freshman, both in Division I-II. The Division I-II Player of the Year award was shared by Jackson’s Rebekah Green and Vinton County’s Cassie Bentley, while the Coach of the Year award went to Lady Vikings’ head coach Rod Bentley. Green also shared the Player of the Year award in Division I-II last season. In Division III, the Player of the Year was Emily Chapman and the Coach of the Year was Jon Buchanan, both of whom represent Fairland. For the second straight season, the Division IV Player of the Year was Waterford junior Alli Kern. The Division IV Coach of the Year went to Lady Wildcats coach Jerry Close for the fourth straight year, winning the award outright for the third time in that span. Rebekah Green, Jackson; Cassie Bentley, Vinton County; Kate Liston, Warren; Morgan Bentley, Vinton County; Myriah Davis, Logan; Emily Jackson, Warren. Co-Players of the Year: Rebekah Green, Jackson; Cassie Bentley, Vinton County. Alex Barnes, Gallia Academy; Laura Manderick, Athens; Haleigh Sammons, Logan; Hannah Kroft, Marietta; Bethany Starlin, Logan. Molly McCutcheon, Warren; Josie Ousley, Vinton County; Peyton Bowe, Warren; Ryelee Sipple, Gallia Academy; Kelsey Brown, River Valley; Grace Way, Warren; Erin Jones, Vinton County; Emma Harter, Athens; Peyton Lunsford, Logan; Marley Haynes, Jackson. Emily Chapman, Fairland; Rachel Richardson, Alexander; Lexie Arden, Ironton; Jessie Addis, Nelsonville York; Emily Compliment, Coal Grove; Lexi Wise, Ironton. 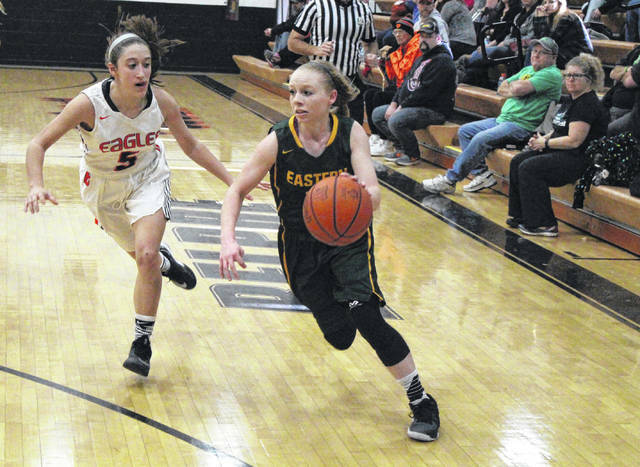 Player of the Year: Emily Chapman, Fairland. Coach of the Year: Jon Buchanan, Fairland. Kassidy Betzing, Meigs; Sydney Mullins, Wellston; Allie Marshall, Fairland; McKena Rice, Alexander; Natalee Hall, Chesapeake. Emilee Whitt, South Point; Caitlyn Brisker, Oak Hill; Mary-Kate McCulloch, Nelsonville York; Alesha Simpson, Fairland; Kasey Murphy, Coal Grove; Destiny Dolen, Coal Grove; Riley Schreck, Ironton; Tori Doles, Wellston; Brooke Webb, Chesapeake; Maddie Scott, Rock Hill. Alli Kern, Waterford; Megan Ball, Waterford; Rachael Adams, Waterford; Paige Tolson, Federal Hocking; Hallie Joseph, Miller; Jensyn Shepherd, Symmes Valley. Player of the Year: Alli Kern, Waterford. Coach of the Year: Jerry Close Waterford. Elizabeth Collins, Eastern; Jess Parker, Eastern; Madison Williams, Eastern; Hannah Duff, Waterford; Sydney Spencer, Belpre. Hannah Dunfee, Federal Hocking; Hayley Duff, Waterford; Ashley Spencer, Miller; Rachael Hayes, Symmes Valley; Kaitlyn Crabtree, Symmes Valley; Erin Evans, South Gallia; Kenya Waderker, Belpre; Chloe Rine, Miller; Alyson Johnson, St. Joseph; Lacey Alexander, Miller.